At the beginning of May, I was lucky enough to be sent a pair of trainers to review from Merrell's new range of "barefoot" shoes (apologies for the contradiction of that term!). I received the Barefoot Run Bare Access Arcs which are essentially transitional shoes for someone (like me) new to the barefoot party, still needing a bit of cushioning. I've been thinking about getting some barefoot shoes for ages , but haven't taken the plunge since trying on some Newtons and finding them pretty uncomfortable, so was excited to see what these shoes were like. Now, unfortunately I'm very shallow, and the looks of a shoe are always important, so I was very pleased when I opened the box and got these out, especially as I didn't know which colour I was going to get. They do look a bit unusual as they are very wide at the front (to allow your feet and toes to move in a natural way when you run) but I loved them straight away, still do, and have had a few comments about them from people which have all been positive! For distance runners and those new on the path to barefoot running, our Bare Access Arc 0mm drop running shoe gives you a barefoot feel, with added toe to heel cushioning. Still allowing your foot to land flat and follow its own natural motion, its cushioning protects from sustained impacts due to longer runs or a new barefoot training program. Anyway, back to what I think ;) I was impressed with how immediately comfortable they were. 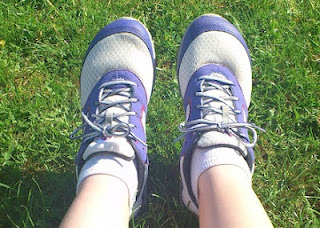 Although I run in traditional supportive shoes with a big heel drop, I spend a lot of my time in flip flops or flat ballet pumps, and so wearing a barefoot feel shoe wasn't a complete shock to my feet but wearing a fully enclosed shoe that had such a wide toe-box was a real revelation. I have wide feet, and to put shoes on and not feel any constriction at all was brilliant. They're also cut low around the ankle and suit my feet really well. I knew I wasn't going to run in the Merrells straight away and decided to just use them for walking around to start with, to allow my body to get used to them. I definitely felt the difference - my feet and legs ached a bit after wearing them all day, but I'm pretty sure that's just because my muscles were working in a different way. They've now become my choice of every day trainer, and I'm an absolute convert to the barefoot style - even if I haven't yet moved away from the supportive trainers for running, I can really recognise the benefit of spending time in a more naturally styled shoe. The only negative I've found with my new Merrells is that although I'd ordered a size 8 (in normal shoes I'm a 7) they came up pretty short, and they're not quite long enough for me - my big toe just catches the inside end seam on the top of the shoe, and bizarrely, although I really like these shoes, I still haven't been for a run in them. I've been telling myself that's because they're short and I'll end up hurting my toes but I think it's just because I've not been brave enough - with all the recent marathons I've had and the upcoming ultras, I've been worried in case I inadvertently did too much in the shoes and hurt my legs/feet, and jeopardised my training.